Tired of the typical perfect-bodied Yoga poster girl? Good news! There’s a new asana posse in town. “Yoga Beasties” are the creation of artist and yogi Gigi Spratley, and if her dream trajectory goes according to plan, these little creatures may just change the face (and body) of yoga as we know it. YogaCityNYC’s Sharon Watts had a chat with her to learn more. SW: You first began with a series of drawings called “L’il Beasties.” How did they come on the scene? GS: They actually were literally born in a dream I had about three years ago. I had been feeling a lot of anger, and in this dream a little creature was trapped in my heart chakra, which opened up and allowed him the freedom to run away—as “L’il Beastie.” I woke up and found this to be very transformative, taking something negative and releasing it this way. SW: Your drawing style is very fantastical. What were your early influences? GS: As a child, I was obsessed with color, and was a compulsive doodler in school. As opposed to being perceived as not paying attention, doodling actually helps you absorb information. I’m influenced by organic forms in both nature and outer space–the microscopic and the macroscopic. I am also influenced by self-taught artists, even though I have a MFA in painting. SW: Can you describe some of your creative process? GS: I work very intuitively; I don’t have a set picture in my head what the final product will be. Otherwise I wouldn’t discover anything! A lot of my imagery comes to me during meditation, sivasana,or even during my asana practice. Yoga is very inspirational for me. Creating art is a lot about being present. SW: “Yoga Beasties” are a spin-off of “L’il Beasties.” How did that happen? GS: I had been showing my “L’il Beasties” art at Yoga High studio when students started requesting them in yoga poses. Everyone has a favorite pose, and more requests came in. They are now available as a limited edition of 150 archival digital prints, at $100 each, for sale at Yoga High. The full range of “Beastie” prints will be for sale on the website when it is launched. I wanted to give Yoga High an exclusive for a limited time since they have been so supportive, and they are my friends. SW: How do you match the “Beastie” to the pose? And which is your personal favorite? GS: They really just evolve. “Eagle Beastie” had to have feathers. “Tree Beastie” had to have leaves. 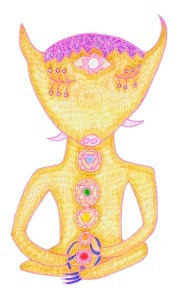 My favorite is “Meditation Beastie,” which was inspired by the colors of the chakras and guided visualization. SW: I am seeing “Beastie” street art–is there a movement brewing? GS: Indeed, there is a movement brewing on the the Lower East Side, and even worldwide–we have sent stickers to friends in India, the UK, Berlin, Italy, Montreal and other far flung destinations. They have been spotted in Hollywood, CA and New Orleans as well. A lot of people prefer to keep them, so they put them on something personal like a phone or other electronic device. In addition, they will be featured on a billboard at a store in Nolita called Quality Mending in the near future. At that time we will unveil the website lilbeastie.com. SW: What else is in the works for the “Beasties”? GS: My husband Jack Waltrip is an art director and musician, and we’ve gotten galleys together for an animated e-book. It’s beyond a YA story, since it appeals to adults as well, and is decidedly non-sugarcoated, with epic battles, a magic dragon tooth with healing powers, and all kinds of moral mayhem. There has also been talk about a kids’ TV show and an animated music video. And we’ve had prototypes made for yoga mats, even perfume! We are also starting work on one for a “Beastie” plush doll. SW: I think this must be very exciting for you, the creator. As an artist and entrepreneur, how do you put it into yogic perspective? GS: We intend to maintain the integrity of this venture with regard to content and quality. Which is why, until we find the right deal for production and merchandising, we are doing the work ourselves. I could not bear to see “Li’l Beastie” dumbed down. The names of the dragons Arjuna and Agni came from the Bhagavad Gita, which I was reading for yoga teacher training. This project wasn’t preconceived—it evolved. And because of the sources: dreams, yoga, meditation, brainstorming with Jack–my creative process is not linear. It’s more of an organic evolution. As for me, I can’t wait for the “dead bug” plush toy to become available. I’m already making room for him on my bed.